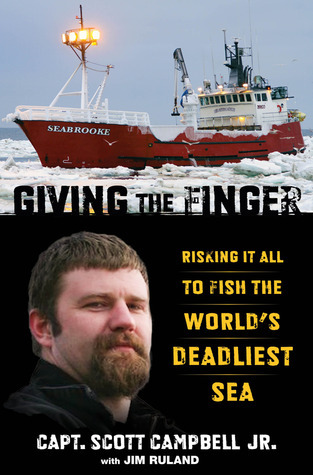 Giving the Finger: Risking It All to Fish the World's Deadliest Sea by Scott Campbell Jr.
We’d love your help. Let us know what’s wrong with this preview of Giving the Finger by Scott Campbell Jr.. Preview — Giving the Finger by Scott Campbell Jr.
To ask other readers questions about Giving the Finger, please sign up. I had heard of Scott Campbell from watching the amazing television show, The Deadliest Catch, and from those short glimpses of him, I was expecting a lot from this book. He only mentions the television program very briefly towards the end of the narration, so if you're a huge fan of the show- you probably don't know much of what's in here and you're in a for a huge treat. This book is a thrill ride of a life I received a free copy of this book through Goodreads First Reads. FTC guidelines: check! This book is a thrill ride of a life story. Scott Campbell, Jr's childhood was extraordinarily tough. His mother was drug addicted and absent, while his father was work addicted and also absent for long periods of time. He struggled with the typical challenges of growing up in addition to a learning disorder and the demands by his father that he begin working ridiculously long and back breaking hours at a very young age. Because of his suffocating childhood and early teens, he became a hell-raising thrill seeker in high school and nearly didn't complete his degree. After high school, the high risk/reward structure of the fishing business in Alaska captured Campbell's attention even though his father tried to discourage him from joining the family business. And, after many hardships and struggles, Campbell's adventures on the sea began. The pressures out on the sea are intense. The fishermen deal with extreme weather conditions, man-crushingly heavy equipment, little sleep, and (sometimes) 24 hour or longer work days. It makes for a very exciting and tense read. In addition to relating tales about his deadly job, Campbell shares stories about his home life and wild drinking nights with his fishing buddies. With one risky decision after another, it's amazing that he's lived long enough to write about it. The ending of this memoir feels open ended and I got the impression that no one, including Campbell, knows what life has in store for him next. I received a free copy of this book via the Goodreads first reads program. Thank you! I really liked the first four chapters, especially the description of all of his close calls (how didn't he break any bones??) and life on the farm and the sea. I had no idea that orchard farming was such hard work. Even though I can't relate to de-icing a boat, and I hope to God that I'll never see exposed bone at work, I did relate to his experiences. Scott writes about the challenges of his life in a way that I received a free copy of this book via the Goodreads first reads program. Thank you! Even though I can't relate to de-icing a boat, and I hope to God that I'll never see exposed bone at work, I did relate to his experiences. Scott writes about the challenges of his life in a way that resonated with me. I received a free copy of this book via the Goodreads first reads program and would like to thank everyone who made that possible. I spent all day tearing through this book and thoroughly enjoyed every second of it! What an incredible, interesting and moving story. I have been a fan of the show since it started and have always been amazed at all the stuff these guys put themselves through. Overall I thought this was a really fun and well-written read and a great story! I received this book in a giveaway on Good Reads. It was a quick read. This book was very interesting and gave you a glimpse as how Junior became the person he is today. You learn a lot about the rough spots he has encountered while being out at sea and the toll it takes on having a family. I would recommend this book especially to fans of The Deadliest Catch. It gives a more in depth look at everything a captain on the Bering Sea has to go through to catch crab and keep his crew safe. Scott Campbell Jr., better known as "Junior" to fans of "Deadliest Catch," chronicles his career in the fishing industry in "Giving the Finger: Risking It All to Fish the World's Deadliest Sea." It's an entertaining look at a dangerous industry, and offers more background information on the history of fishing in the Bering Sea. The style of writing is rather conversational, making it a quick read. Fans of the show will enjoy it. This book is a wild adventure that never stops. Very enjoyable, very well written. Explore the world of arctic fishing without getting wet and cold. a fascinating story about one man's dedication to life as a crab fisherman in the Bering sea. I enjoyed this and found out many things about crab fishing which was good since we are huge fans if the show. This is one of the Deadliest Catch boats. The book itself followed very well and made for a quick read. Scott Campbell came off as a bit arrogant but owned up to his mistakes. The part that really bothers me is many of these guys seem to glorify the party drunk fisherman image. Yeah some do, but many don't. Interesting re danger of the job and particularly length of seasons and impact on family life. Vocabulary and structure is pretty basic. I love stories from Alaska, the fishing boats the details of the jobs on ship, the hardships the crew endure, the big bucks , the adventure! good book and \now i get the title after reading it! I always enjoy reading the behind the scenes of the fisherman and this was no exception.